I can’t think of a child who doesn’t get excited about the anticipation of a visit from the Tooth Fairy! 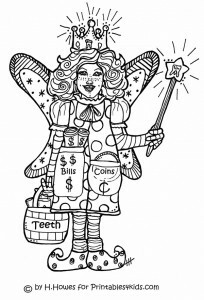 Click the image above to view and print our very own Tooth Fairy coloring page. Use the activity to help celebrate that wiggly tooth, introduce the Tooth Fairy to your child or just for fun! LOVE, LOVE, LOVE this SaSsy LaDy! She’ll be a great addition to my repertoire of thingys to promote my children’s dental health.